T-CZ a.s., is focused on production activities and provision of services in the electronics branch, namely of civilian as well as military nature. It operates in both domestic and international markets. Within the branch, it is following up with the activities of TESLA Pardubice, a state enterprise that used to prosper very much in the past. Currently, the Company has primarily been orienting and further developing its activities in the branches of radiocommunication and radiolocation technology. In the branches mentioned above, T-CZ offers comprehensive services to its customers that are of high professional standard. It provides for research and development of new equipment and performs exacting prototype as well as type tests. It produces functional samples and prototypes, and provides for repeated single-part production and low series production as well. It undertakes complete deliveries including assembling, installation and operation start-up. At the same time, it also provides for project design and consulting activity, training of equipment operators, and for warranty and after warranty service. 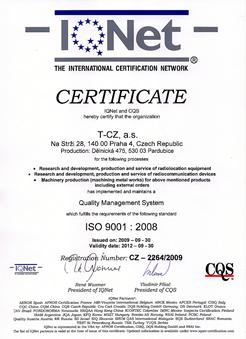 Within the framework of after warranty service, T-CZ offers servicing of older type radar equipment of RP and RL series from the former Tesla Pardubice product line, including KRTP 86 equipment. We offer partial or complete upgrade of those radars as well. For manufacturing and R&D activities, the Company is utilising its own premises provided by appropriate technical and technological base, standard for activities in the branch of radiocommunication and radiolocation technology. The Company utilises its own type-test facility. Company's facilities have been concentrated into a production plant owned by the Company and are located at the new production plant address. PAR RP-5GI is a sophisticated radar device providing complete radar information necessary to precision approach and landing of all types of aircrafts. It's modular design, simple installation and compliance with all ICAO recommendations enables its full integration into existing systems without necessity of their essential changes or civil engineering adaptations. The device offers a modern primary and secondary data processing of the radar information and their synthetic display. Also extensive diagnostic based on BITE system is built-in. The radar is airfield surveillance radar operating in S-band with the range up to 120 km, designed for aircraft monitoring and control in air-port terminal maneuvering areas. KOMAR 2 is compact, light, mobile, modular, open architecture (combined) radar system. It provides high performance target detection in the airspace around an airport or air base. It is designed for the air traffic navigation and control in temporary, reserve and stationary military advanced airfields. Railway Communication System DKS performs the function of communication facility with relationship to interlocking means of train and to operation control of railway service. The system ensures connection between engine driver and train dispatcher, dispatcher and/or other railwaymen participant on railway service. The system DKS ensures whole volume of voice communication for complete operation needs together with possibility to integrate the radio-communication system into control and information technologies used in contemporary railway systems. Simplex ribbon radio system is designed for creation of base side of ribbon radio system network enabling interconnection between fixed participant (dispatcher) and moving object (portable or car radiostation), moving along the determined main transport routs (railway transport, highway transport, water transport). Railway radio communication system has been designed for the Czech Railways, respecting their specific requirements and the determination is to create the ribbon radio communication network allowing communication between mowing subject (locomotive - engine driver) and fixed post partner (dispatcher, guard). LESANA CZ type Command radio set is designed for wireless remote control of machines working in civil engineering industries and mainly in woods and forests industries. The set consists of transmitter that the operator fixes on her/his clothes at belt height, and of the receiver placed on a machine to be controlled. The commands are prompted by means of pushbuttons with a momentary position or by change-over switches with a stable position. 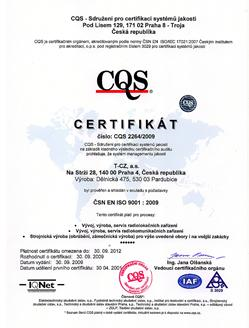 Specialized divisions of T-CZ Company in antenna branch and VHF/UHF techniques, they have a long run tradition in design and production of antennas in frequency bands from 27 to 1000 MHz. They have a skilled background and adequate equipment of devices. The main scope of antenna products is in the frequency bands up to 450 MHz. Our company has specially terrain workplace for antenna testing in open space with minimum reflections and industrial interference.